The fall flew by! Can you believe it is almost Thanksgiving? I am thankful for extra time off with my children. We love to get creative in the kitchen, especially when it comes to sweets. We were talking with our friend from the San Diego Honey Company about how we like to bake with unrefined sugars, such as local honey. We put our brains together and collaborated on this Honey Bourbon Pecan Pie. 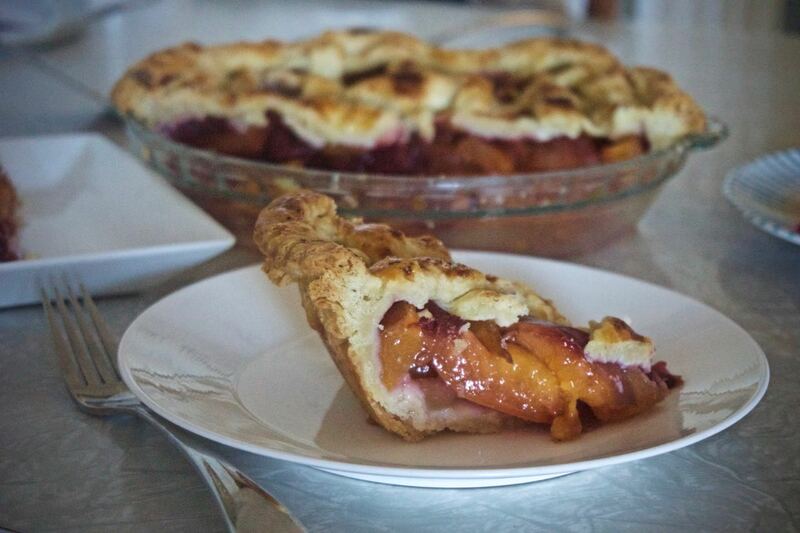 See if you might like to try it for Thanksgiving dessert! If you have seen my recipes for Chocolate Espresso Pecan Pie or Pumpkin Pie, you will know that I try to steer clear of corn syrup. I also often reduce sugar in my recipes. Honey adds subtle layers of flavor that compliment the other ingredients. Why not add flavor and avoid GMO’s? To be honest, I bake the Chocolate Espresso Pecan Pie every year. It’s just a winner. But this year I wanted to experiment with something new. Since bourbon goes so well with honey and pecan, I figured this one couldn’t go wrong. To select which honey to use, I picked the brain of Lisann, who owns the San Diego Honey Company, and makes the infused flavors herself. 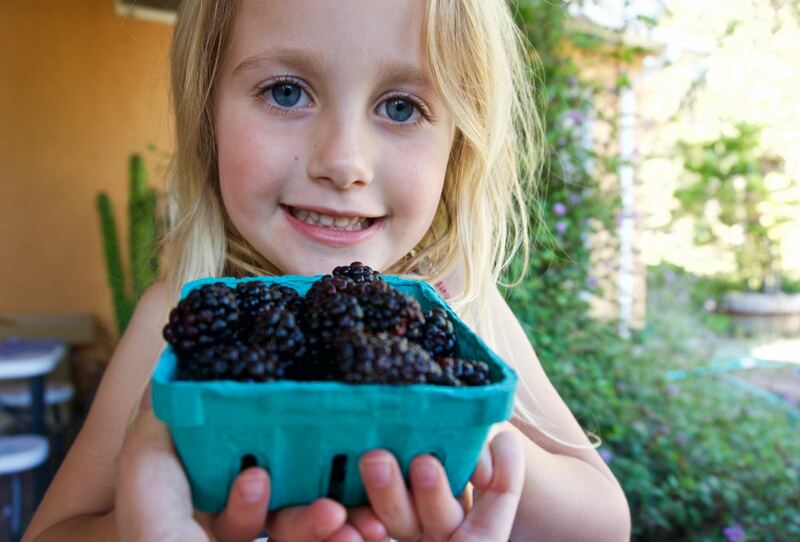 You can talk to her directly at the Solana Beach Farmers market every Sunday. I also pick up her honey at Specialty Produce or Sprouts. (The super fresh pecans were from Specialty Produce.) I asked her which honey would go best in this recipe. “Vanilla Bean!” she said. The vanilla bean honey has a ton of flecks of real vanilla, which compliments the sweet custard of a pecan pie. Next, I thought about my mom’s classic pecan pie recipe. It uses half a cup of light corn syrup and half a cup of dark corn syrup, as each have their own flavor notes. To mimic the match, I used half vanilla bean honey, which is in a light honey base, and half avocado blossom honey. If you have never had the pleasure of tasting avocado blossom honey (sounds like a total San Diego thing), it is super dark and tastes like molasses. For reals. The only difference in baking with honey vs. corn syrup or maple syrup, is that you will want to heat it up slightly. This helps it to mix much easier, especially if other ingredients are cold. I warmed the honeys, brown sugar, and butter until just melted, and then let them cool before mixing with the rest of the ingredients. Do you bake or cook with honey? Try this twist on a classic American pecan pie this Thanksgiving. Honey replaces corn syrup and adds extra flavor, complimenting the sweet bourbon. Cut the butter evenly into small pieces, place on a plate in the freezer, and chill for about 30 minutes. Put ice and cold water in a measuring cup and chill. Place flour and salt in the bowl of a Kitchen-Aid mixer. When butter is frozen, use paddle attachment with mixer on the very lowest setting, and drop butter in a few pieces at a time. Stay close by. When the chunks of butter are slightly larger than pea size, dribble in the ice water until dough does not appear dry and JUST begins to come together. Move the dough to a dry surface and push together with the heel of your hand. Try not to knead or overwork the dough, you want it to come together so you can roll it out. This dough can be used right away! This amount makes enough for a top and a bottom, or two bottom crusts. You will only need one half for the pecan pie. If you are not going to use it right away, double wrap it in plastic and refrigerate for 3-4 days or freeze for up to a month. After rolling out the crust and gently placing it in your pie dish, place it back in the refrigerator until it is ready to be filled. Place the honeys, brown sugar and 3 T of butter in a saucepan on medium heat. Tip: you will want a spatula to scrape all of the sticky honey out of your measuring cups. Heat, stirring occasionally, until butter and sugar and just melted. Take off heat and let cool to room temperature. Once the honey mixture has cooled, gently stir it into the eggs and pecans, until just combined. 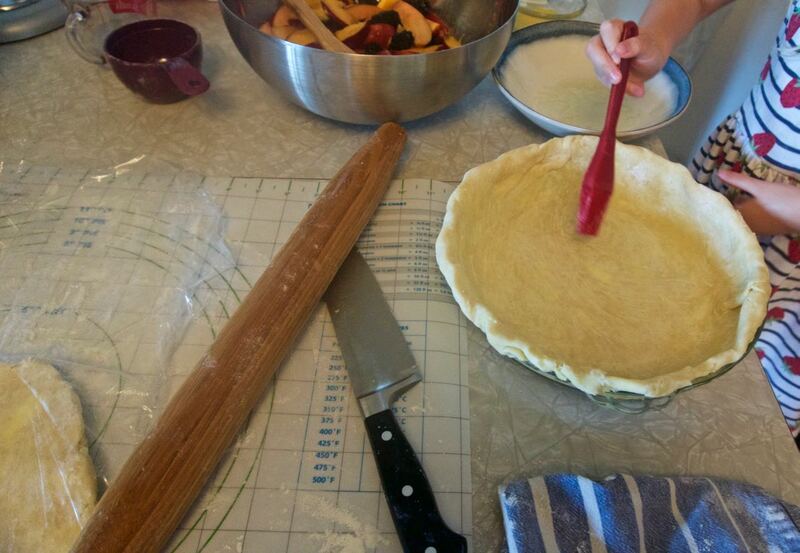 Pour into the prepared, unbaked, half pie shell. 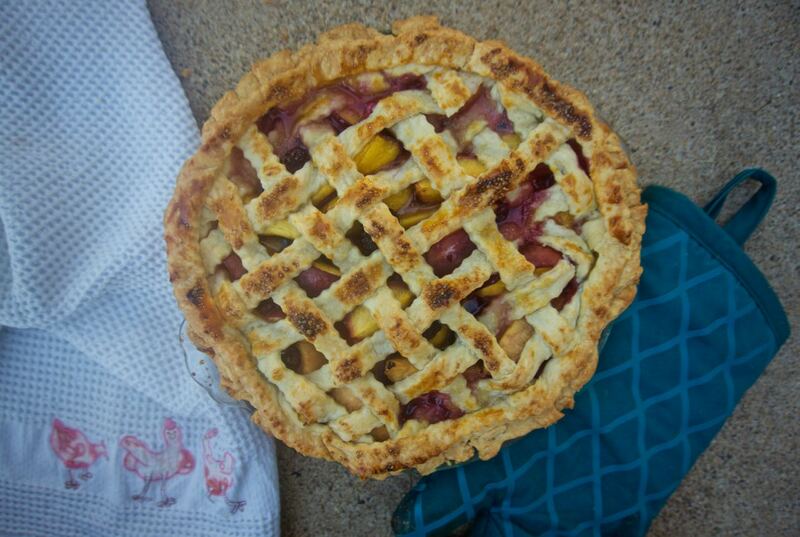 For more photos of and tips on this crust and baking pies, see this post. Save this, or other Thanksgiving favorites, to Pinterest! Raw pepitas, or green pumpkin seeds, have a sweet and nutty flavor. They are the perfect base for a streusel topping. Use it to top pumpkin muffins, ice cream, oatmeal, yogurt parfaits, or this satisfying pumpkin custard I shared today. A crunchy topping, made with green pumpkin seeds (pepitas), brown sugar, oats, and cinnamon. Perfect for topping pumpkin pie or ginger pumpkin custard. Keep leftovers to top ice cream, yogurt, and more. Melt the butter in a small glass mixing bowl by microwaving for 10-15 seconds. A few unmelted lumps are fine. Add the rest of the ingredients to the bowl, stir to mix well. Scatter the batter over a baking sheet lined with a silicon mat or parchment paper, and bake for 5 minutes or until browned. My streusel still looked "wet" when it had started browning. I pulled it out of the oven anyway and it turned out well. Don't let it burn. It’s officially pumpkin season! San Diego weather may change its mind on a daily basis, but pumpkin everything gets the green light in my book! Today I’m sharing the recipe for a ginger-maple pumpkin custard topped with a pepita streusel. This creamy alternative to pumpkin pie is made extra gingery with both fresh and dried ginger, and sweetened with maple syrup. The pumpkin custard is gluten-free, with no refined sugars, and no cans. Like in my pumpkin smash cake recipe, I won’t tell anyone if you speed the recipe up with canned pumpkin, but try a real pumpkin one time so you can taste the difference. I use whole cow milk, but you can substitute any milk alternative. 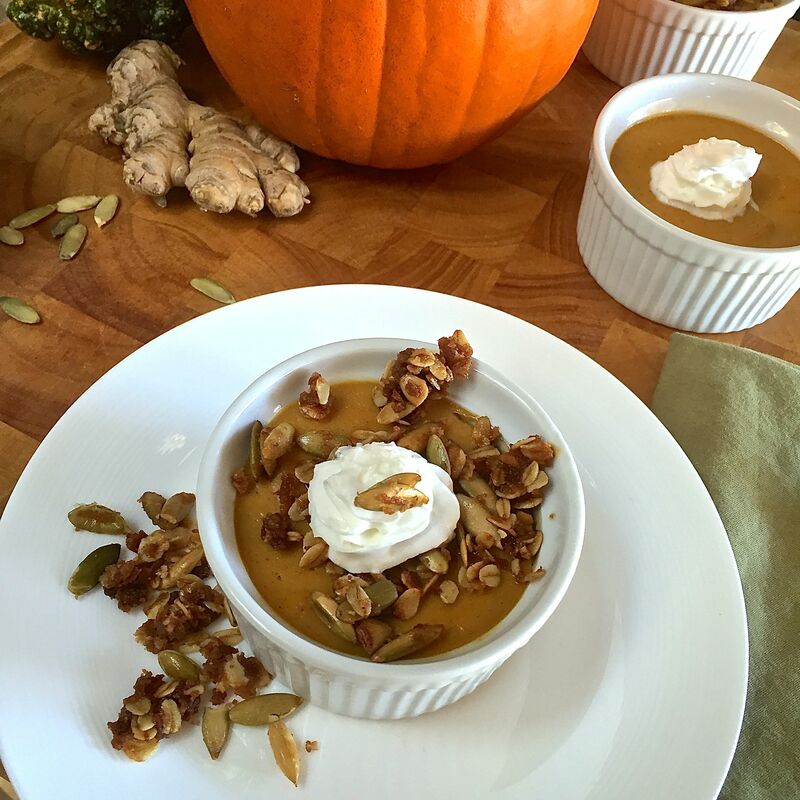 This custard is adapted from the filling for the real pumpkin pie recipe. We topped it with real whipped cream (get the “real” food trend?) and a pepita (pumpkin seed) streusel. Find the streusel recipe here. Papa Bird and the little birds grew pumpkins this year from seeds saved from last year’s sugar pie pumpkins. Specialty Produce is also fully stocked with baking and decorative pumpkins. Try the recipe today and you just might be eating this surprisingly healthy custard for dessert and breakfast. Or else pin the recipe to save and try later! A creamy alternative to pumpkin pie, made extra gingery with both fresh and dried ginger, and sweetened with maple syrup. Gluten-free, no refined sugars, and no cans. I use whole cow milk, but you can substitute any milk alternative. Adapted from my "Real Pumpkin Pie" filling. If you are using homemade pureed pumpkin, add the rest of the ingredients into your food processor or blender. Mix until combined. Place six to eight custard dishes or ramekins inside of a large roasting pan. Fill the small dishes/ramekins with the pumpkin batter. Pour water into the large pan, being careful not to splash water into the custards. Fill the pan until the water level is even with the level of the batter in the small dishes. Bake for 40-45 minutes or until the center of the custards are "set." Remove the custards from the water bath and cool on a wire rack. Serve with streusel and/or whipped cream. 1. If starting from a fresh pumpkin: Use a "sugar pie pumpkin" or "pie pumpkin" and not a decorative jack-o-lantern type pumpkin. Preheat oven to 350* F. Wash the outside of the pumpkin well. Cut off the stem of the pumpkin, and then cut in half vertically. Remove the seeds and strings. Rinse and save the seeds for drying and replanting and/or roasting. Place the two halves of the pumpkins on a baking pan lined with a piece of foil that is twice as long as the pan. Fold the foil over the top of the pumpkins and bake for 75 to 90 minutes, or until soft. Allow pumpkins to cool (they can be refrigerated over night.) Peel off the skin, and any overly browned parts. Place the flesh of the pumpkin in a food processor or good blender and puree until smooth. Leave the pumpkin in the processor or blender, and add the rest of the custard ingredients. An average sized pumpkin makes about 2 cups of pureed pumpkin. A little more or a little less is fine. 2. Nutrition figures are for 8 servings. I made 6 large custards, and we felt full after half, so it could easily serve 12. I split the difference and calculated for 8. Nutrition is also for the custard as written, and does not include streusel or whip cream topping.